The end of act two, scene eight of Peter and the Starcatcher could be the most spectacular moment in the show–a massive crack of thunder, flashes of lightning, cast members scattering in all directions off stage and a giant mermaid tail swimming rapidly (yet effortlessly) into the vom (i.e. an exit/entrance passageway). Pure theatre magic. The entire instance lasted under thirty seconds, but the concept, design and blocking took weeks to perfect. Long before Missy Sullivan (Teacher) sat atop a ladder and looked down at Peter (played by Alex Daly) lying like a snow angel in the middle of her parachute mermaid tail, director Chanda Calentine, set designer Jill Summers and costume designer Carina Lopez huddled to brainstorm. The concept was fuzzy at first: multi-use fabric of some sort that could portray water or mermaid tails. Yet, when Chanda asked that Teacher’s mermaid tail drape down from Missy and cover part of the stage and Carina suggested it flow over the stage entirely, a brilliant idea was born. So, the work began to find enough material to do just that. While fabric was plentiful at ACT, acquiring the right kind proved to be difficult. There needed to be enough to make 12 mermaid’s tails, a giant 30 foot by 20 foot mermaid tail for Teacher, and 4 smaller rectangular pieces to be used as water. 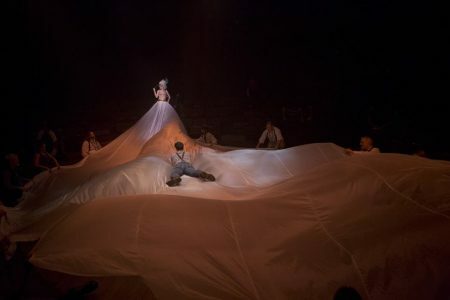 The fabric also needed to be able to be lit effectively and had to be durable since the actors would be dancing with it, sitting on it, pulling it, shaking it, running with it, etc. With this information in mind, Chanda reached out to Robin Oswald and her husband John, who is President/CEO of Mills Manufacturing, and the decision was made—parachute material. Robin and John generously donated a huge amount for the show, and ACT could not have been more grateful. The vision began to take shape. After long hours, the mermaid had a tail…well, except for decoration. While dying it was a thought, the decision was made to let it remain white and, instead, change its appearance with light. During tech, lighting designer Rob Bowen played with variations of pattern and color. A final peaceful, pink and orange glow with rotating water gobos gave the material both movement and a beautiful, soft aesthetic. 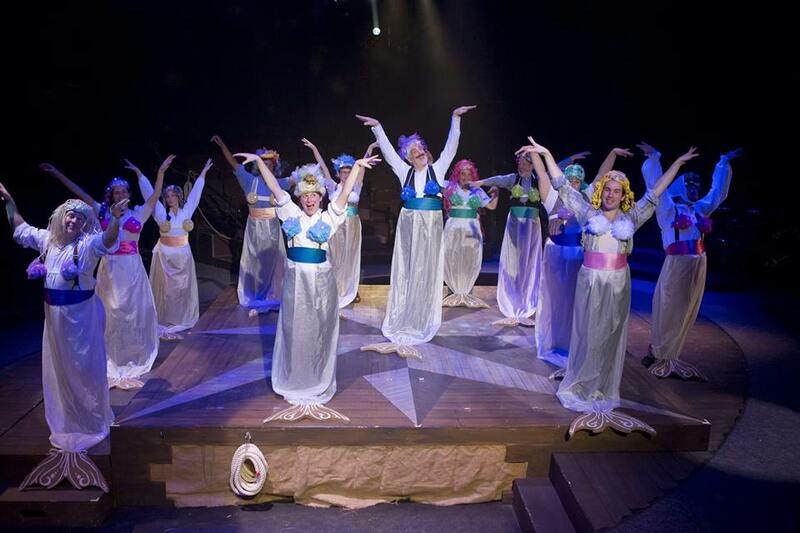 The lighting complemented Chanda’s blocking with the majority of the actors seated on the outside of the oval stage, holding the tail and subtly raising and lowering it to create gentle waves. Finally, it was show time. It’s not hard to imagine the reaction from audience members and, in fact, even up through the final performance, gasps, oh’s and ah’s still emanated from the crew as they watched backstage. An unforgettable moment built from hard work, generosity, and a little bit of starstuff. If you missed the performance, take a moment to check out some of the breath-taking photos (snapped by Misha Schmiedecke) and the video (taken by Carina Lopez) of the magnificent Teacher tail. Again, we’d like to thank Robin and John Oswald and Mills Manufacturing for donating all of the parachute material for the show. They were extremely kind to do this, and we cannot say thank you enough!